Please consider sharing a testimony on our Testimonies page! Thanks! Let us know what you think about Jesus Text Me, or share a testimonial with us via our Contact Us form. Is Jesus Text Me a blessing to you? Would you leave a testimony? If you are blessed by these messages, would you click the link and leave a testimony? You can also rate it in the app store. Thanks! Gmail & Boost Mobile have suddenly blocked messages. If you don't get messages, please try using the Apps. Trying to get the problems resolved. Thank you for your prayers - I believe JTM is fixed! Almost finished upgrading JTM - just a few hiccups to fix. PLEASE PRAY! We upgraded our server, but it won't automatically send or create the messages and no one knows why. So please pray it will be fixed quickly. THANKS! If you know of children who were abandoned, abused or neglected due to addicted parents, you know the lifelong pain it causes. Help us stop the cycle by healing the fathers and returning them to their children as healthy, loving providers. Click the link to find out how you can help us. If you haven't received any messages, it is because our server had issues and the process stopped while they Holy Spirit was picking out your individual messages. :-)<br /> I'm trying to re-run everything now, but it takes several hours. Hopefully, everything should be back to normal tomorrow. Thanks. We are upgrading Jesus Text Me to work with the newer phones. If you have an IPHONE and would like to beta test the new version, please email jesustextme@gmail.com stating IPHONE BETA TESTING. Thanks!<br /> <br /> ANDROID TESTING COMING SOON! If you'd like to beta test on your android, please email jesustextme@gmail.com stating ANDROID BETA TESTING. What changes can we make to the JTM app for you? 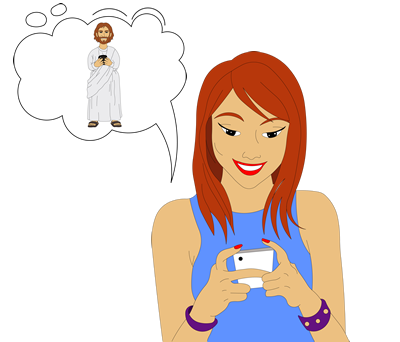 We are updating the Jesus Text Me apps to work with all new phones. <br /> WHAT CHANGES WOULD YOU LIKE TO SEE on the apps? <br /> Go to the link and tell us!<br /> In addition, we would like to start sending you FREE GIFTS from different ministries in return for their support of our Men's Recovery House in Jasper, GA, http://goodshepherdrecoveryhouse.org. <br /> WOULD YOU ENJOY RECEIVING FREE GIFTS? Please let us know. Join a FREE Online Celebrate Recovery 9-month 12-Step Study on Monday nights from 8 - 10 pm EST starting June 18th. Start the healing for your hurts, habits and hang-ups with Penny Haynes, Licensed Pastoral Counselor. Click the link to learn more. If you strugge with Depression & Anxiety, including Panic Attacks, join Penny Haynes for a one (1) hour live video seminar that will provide you with many natural and free techniques to cope with the symptoms. Monday 4/16/18 8pm EST. All registrants get access to the recording and a PDF of tips and tools. For more information, click the link. Have you been blessed by Jesus Text Me? Then please consider adding a Testimony so others will be encouraged to subscribe. Click the link to add yours today. You can also rate us on the app stores. Thank you, and God bless you! Hurting? Feel Alone and Disliked or Unloved? If you NEED to be liked and approved by others, then this 16 Wk Codependency Workshop will show you why and how to heal it. Only $10/class including workbook. Starts Sunday 1/28/18 6:30-8:00pm EST. Live streaming & recordings. Our Jesus Text Me messages table crashed and is now fixed. Messages should resume in the morning. My apologies, and thank you to Erica for pointing this out! Christmas Gift: FREE Ebook - Why Don't I Have Any Friends? Many people are hurting and lonely because they feel like they don't have any friends. This free ebook will help you heal your hurts and make and keep friends. Coupon code is "friends". Merry Christmas! Monday 12/18/17 at 9 pm EST, Penny Haynes is offering a FREE Online Pastoral Counseling Q&A session. Click the link to register. If you struggle with family issues that cause you pain, then join Penny Haynes tonight for a FREE class at 9pm EST on how to handle people who don't treat you kindly. Click the link to find out more and register. Afraid no one will ever love you? FREE Class on SHAME Mon, 11/20/17 9PM EST. If you struggle with feeling like there is just something wrong with you that cannot be fixed, or fears that no one will ever love or accept you, then you deal with SHAME and this live Class is for you. <br /> <br /> Penny Haynes, Licensed Pastoral Counselor and creator of Jesus Text Me, will host this FREE Class on SHAME Mon at 9pm EST. Click the link to Register. You can attend by telephone or web cam. If you are struggling with depression, anxiety, addiction or behaviors you can't stop, join Penny Haynes, Licensed Pastoral Counselor, on tonight's FREE Counseling call. 1 registered participant will receive a FREE COUNSELING SESSION. Click the link to register. If you are struggling with depression, anxiety, addiction or compulsive behaviors, Penny Haynes is offering a free teleconference counseling call. 1 registered participant will win a FREE Counseling Session over Skype. Click the link to register. Here's a free ebook with scriptural tools to combat your flesh & the enemy's attacks. Use coupon code jtmooc at checkout. Thank you for your patience while we had our server issues. All seems to be back to normal, praise God! Have a blessed day of worship. How did you hear about Jesus Text Me? I would love to know how you found out about Jesus Text Me. Please use the contact us form link or reply to this text to let me know. I trust that it is a blessing to you, and that the Holy Spirit is using it to minister to you when you need it most. Has Jesus Text Me blessed you? Then please share a testimony by clicking the link below. 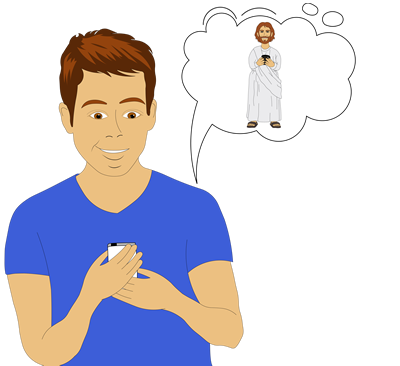 Has Jesus Text Me ministered to you at just the right moment? Then please take a moment to share your testimony with others so they will try JTM too. Use the link below. And thank you for being a subscriber! Would you like to minister to other JTM users? You know the 3 - 4 sentence type of messages we send. Would you create a few encouraging messages based on your favorite verses? If so, please click on the link. May God bless you as you bless others through this ministry! Has Jesus Text Me Been A Blessing To You? If Jesus Text Me has encouraged your walk in Christ, would you use this link to leave a testimonial? We'd also love for you to rate the app and share the service with others. May Jesus Christ be lifted up in our words and our actions as we prepare to celebrate His death and resurrection. Have a blessed Easter! Help people keep their New Year's resolution to spend more time in God's Word by sharing Jesus Text Me. Share this link on FB, Twitter & texts with friends. Happy a blessed 2017! Has Jesus Text Me helped you? If so, please share a testimonial on our web site and rate our app! Please help share Jesus Text Me by posting a testimony on our site or App site. Thanks for being a part of our family! If so, please consider sharing a Testimonial and/or rating our apps on the stores. It only takes a minute - thanks! One more upgrade to the iPhone app! When you get (or update) your iPhone app, you will see a new page with 2 buttons at the top. This will let you switch between the default view that shows ALL messages combined and the list of message feeds (where you can delete a feed if you need to). It is a much quicker and easier way to see all of your messages as soon as the app opens! This link shows you all of the screens the Android and iPhone apps offer. NEW & IMPROVED Android & iPhone Apps! Need help with a particular struggle? If you are struggling with a certain situation, like grief or a habit you can't break, or are having trouble believing God's promises, sometimes you need to hear a particular scripture, theme or word from God over and over. If you add your own private messages to Jesus Text Me, we will randomly send 3 of them per day to you in addition to your other messages. Just log in to http://JesusTextMe.com and click on Messages. Add whatever message you choose and select Private instead of Public. You can delete them at any time, or even decide to make them public to share with others later. Log in today to add reminders of what Jesus has been saying to you. Use them to replace "old tapes" that replay in your mind with the truth of God's Word! Has Jesus Text Me blessed you lately? Did you receive a text from Him that was "right on time?" Or get a message that seemed as though He was reading your mind? If so, please consider leaving a testimony so others can be encouraged to receive the messages too. Click the link to go to the Testimonials page and share your story. Thanks! I know how busy you are, but if you would take a moment to share anything good you have experienced through Jesus Text Me, I would be SO GRATEFUL. If a message came at just the right time, that could encourage someone else to sign up. Just click the link to go to our new Testimonial page and enter it there. It will be reviewed and then posted. Thank you so much for being a part of Jesus Text Me!